The finds shown below were recovered from disturbed archaeological deposits in Bone Passage during 2003. This material had been disturbed by cavers attempting to gain access to new passage in the system during 1997 and as such, had been subject to damage by additional visitors to the site for around six years. 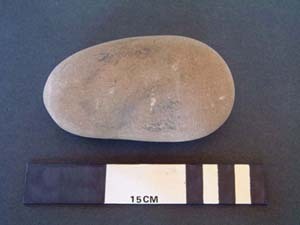 One of several coarse pebble tools found in the cave passage. This is a pebble grinder manufactured from Torridonian Sandstone, one end of the tool having well-worn facets. The function of the tool is as yet unknown - any ideas? 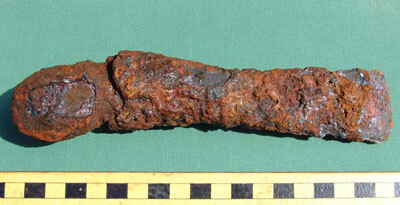 This iron socketed adze is one of the few iron objects to have been found so far at the High Pastures site. Designed around the earlier forms of bronze socketed tools, the adze has a section of the mineralised wooden handle still in place, while the cutting edge is still reasonably sharp. The adze would have been a useful item for wood-working, while the butchery of animals could also have been another use. Animal bones recovered from the cave exhibit various cutting and chopping marks, some of which might have been made using the adze. 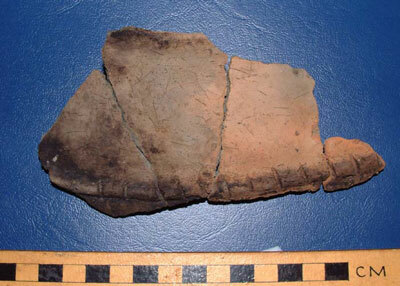 Several sherds of pottery of prehistoric age were recovered from Bone Passage. Those in the image above refit back together and form part of a decorated vessel of Iron Age date. A decorated cordon has been applied around the waist of the pot, while organic residues on the inside may relate to the remains of food cooked within. Such deposits can be analysed to provide a wider picture of the use of such vessels on prehistoric sites.